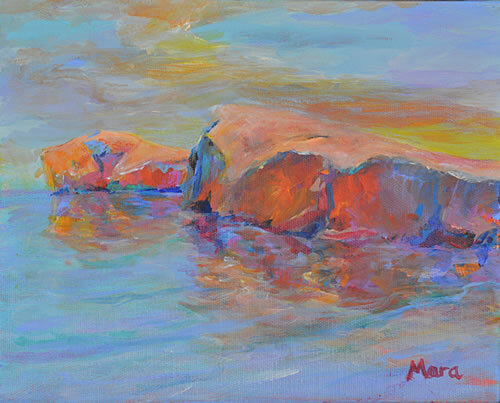 I find the Dalmatian landscape to be a wonderful inspiration, and I’m really enjoying my Painting Rocks! series. At the same time, I’m also exploring the work of local artists, especially those whose work is so evocative of this area. So this week, I’ve taken a work by Mato Celestin Medović, and created my own small homage of his beautiful “Dvije Stijene”, Two Rocks. I think my alternative title to this would be Rocks on Fire – Medović’s original is rather more serene, as you can see below! “Dvije Stijene” is alive with colour, just look at that bouncing light and the ripples in the water. His rocks are warm and solid, simple shapes but there’s so much going on in the shadows. Just glorious!